Magnelab recently released a new line of UL-Listed split-core current transformers. The design of the new current transformers is exciting! How will they perform? In this post I’ll briefly cover some of the changes I noticed in this series, and then show how these CTs compare to Magnelab’s previous series in terms of performance. These CTs are hinged (many of Magnelab’s previous models are not). I like this style because I think it makes installation a little easier. You could, for example, install the hinged CTs using one hand, if necessary. Or, if working on a “hot” panel, it might be easier to hook the top of the CT around a conductor, rather than needing to get your entire hand behind the conductor to apply counter-pressure. The mold of the CT is nice, including a helpful direction-of-current indicator under the top of the CT, which starts with a “K”, followed by an arrow pointing in the direction of “L”. Given that this is part of the mold, and in a very prominent area, I think this will reduce the number of CTs that get installed backwards. The quality of the polishing of the surfaces where the core meets up with the top is very good – we’ll see how much this helps performance in a minute! The leads are 18 AWG (required by UL 2808), but they are not twisted pair wiring but rather side-by-side. I’ve heard that twisted pair wiring helps reduce interference, I’m curious how these CTs will perform. Overall, the construction of the CTs looks robust. I can tell that these CTs have a little more core in them, compared to Magnelab’s previous line of CTs. 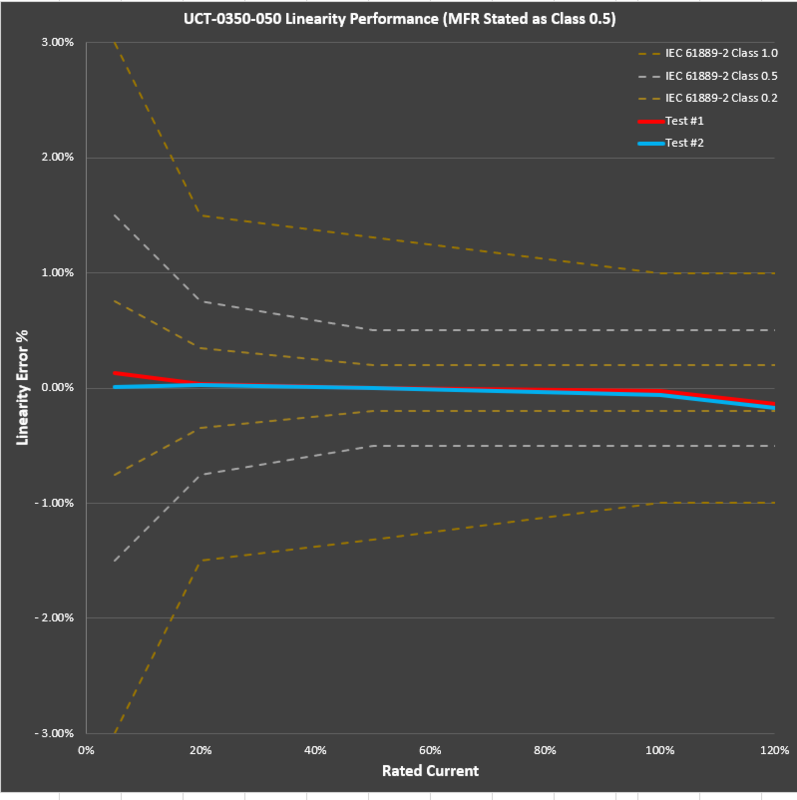 My assumption is that this was required to meet UL 2808 specifications, but perhaps it was done to improve performance (these CTs are Class 0.5 – 99.5% accurate at full-scale – whereas the previous series had 1% error). 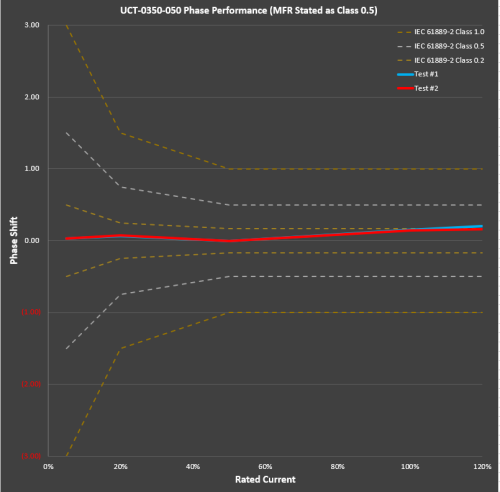 The first units I tested were the new UCT-0350-050 series. These circular, solid-core CTs have a 0.35″ opening (9 mm) and are very small and lightweight (sort of the exception to my earlier comment about these UL CTs having more bulk). As Magnelab’s famous fruit shows, the CT is about half the size of a large strawberry. On a separate note, I like the fruit! Why not taking something industrial, and rather boring, and show it next to colorful fruit? Anyway, I digress. You can see the results of the two UCT-0350-050 CTs that I tested in the graphs below. Magnelab’s data sheet indicates that these are 0.5 Class, but you can see that on linearity they tested much better than that, easily meeting a 0.2 Class in terms of performance. In terms of the phase angle shift, the units easily passed a 0.5 Class requirement, and just barely met the 0.2 Class requirements (Excel makes the graph look like it goes outside the 0.2 Class bounds at 120% of the rated current, but the actual measurements of the tests were 0.2° and 0.16°, respectively). In summary, not bad! Let’s move on to the next unit in the series, the SCT-0250-030. These split-core CTs are tiny! The opening is a mere 0.25″, which seems really small, but turns out to be plenty for 12 AWG wire (see chart for detail) found commonly in residential and commercial circuit breakers. These breakers are often 20A, 25A or 30A rated, so I think 30A was a good choice for Magnelab to start with. The linearity on both units was outstanding, well inside the 0.5 Class requirements. For such a small CT, that is split-core, this is impressive. Regarding phase, the units tested well. Honestly I was skeptical if they would be able to meet a 0.5 Class requirement for phase, and as you can see, at some test points, the CTs fell out of spec. Although not ideal, these units tested better than I expected. To compare, I’m showing how the SCT-0400 series (Magnelab’s smallest size until the SCT-0250 came along) tested in an earlier test I performed last year, and wow, you can really see the improvement! Next, I tested the SCT-0450-050, which despite the typical nomenclature used by Magnelab, actually has a 0.47″ opening (not 0.45″), which is 12 mm. The height of the opening is just slightly larger. This size is interesting to me – it’s slightly larger than Magnelab’s current SCT-0400 series, which has a 0.4″ opening, and makes a good next-size-up offering from the SCT-0250. It’ll be interesting to see if these units will cannibalize the SCT-0400 sales over time, or if Magnelab will have enough sales of each series to keep them both over time. The SCT-0450-050 did very well in terms of linearity, but fell just barely outside of spec at certain phase shift test points (at least with my testing equipment). The last units I tested were the SCT-0950-200s, which measure 0.94″ x 0.98″ (24m x 25mm). 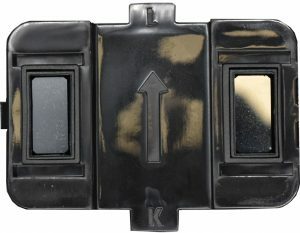 These are large enough to fit around the “mains” of a residential panel, with room to spare. I imagine these will work well in many industrial environments where two conductors need to fit inside. Despite their size, they feel a lot less bulky to me than Magnelab’s SCT-1250 series – of course their opening is a littler larger, but I think the SCT-0950 series is a good addition to the product line. At times the SCT-0750 is too small, and the SCT-1250 was too big. As you can see in the test results for linearity and phase, the units met their stated accuracy class (0.5). In conclusion, while not quite perfect, the new UL-Listed series by Magnelab is a great addition to their product line, and they perform very well. Please share your experience working with them!